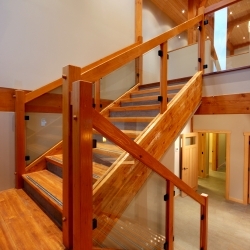 This contemporary timber frame head office and manufacturing facility won the Best Commercial Renovation in the Fraser Valley from the Fraser Valley Real Estate Board in 2012. The original warehouse/manufacturing part of this building was given a major renovation, while the original office was demolished and a 2 story 4000 square foot contemporary timber frame office was built. The new building incorporated the latest building technology including geothermal heating/cooling, automated lighting, storm water retention system, soya based spray foam insulation, recycled tile/carpet, and reclaimed wide plank engineered hardwood flooring. The office building was designed to let in as much natural light as possible while making sure, by taking into consideration the position of the sun, that it did not get too warm or bright. 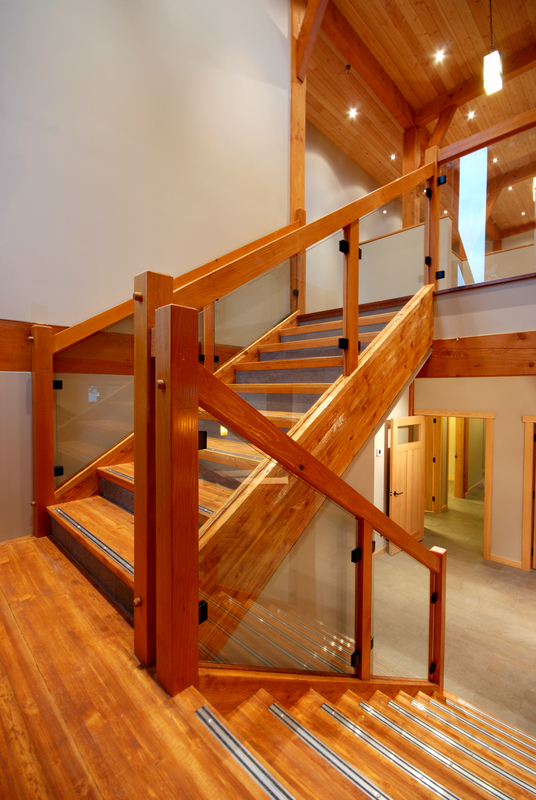 The douglas fir timbers and high ceilings make this spacious office a wonderful relaxing environment to work in.